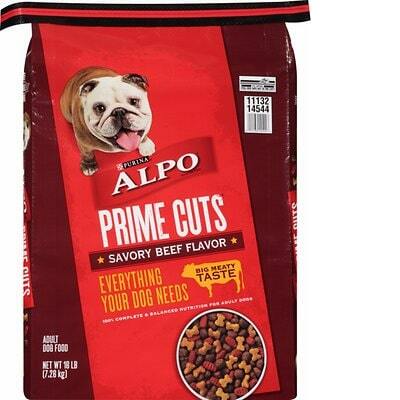 ALPO Prime Cuts Savory Beef Flavor is a lower-end dog food at a low price. This product has 10 controversial ingredients, which includes artificial colors and flavors. The food has a high amount of carbs, compared to its protein and fat and uses relatively low-quality meat and fats. Nestlé Purina, which owns the ALPO brand, has more than the average number of recalls. But on a good note, they were overall pretty transparent when answering our questions. The average dog food we reviewed has 39 total ingredients, with 1 controversial ingredient. This product has a staggering 10 total controversial ingredients and 4 of them are found in the first five ingredients. This is concerning because the first 5 ingredients make up most of the product. Let’s take a closer look. Beef tallow (also known as Beef Fat or Greaves) is the fat left over after cooking beef parts. It's a high-quality dog food ingredient that provides calories, nutrients and flavor. Mixed-Tocopherols are a natural preservative made from Vitamin E that helps keep food fresh. We consider it a high-quality dog food preservative. Ground yellow corn is a lower cost ingredient that does provide energy, but dogs can be sensitive to it. As a kernel it is not digestible, so it must be processed, but that processing leads to a higher glycemic index. Yellow corn is not generally considered a controversial ingredient, but is controversial if it is used in the top five ingredients (which make up about 80% of the food's weight) where a named meat or lean protein would be more nutritious. 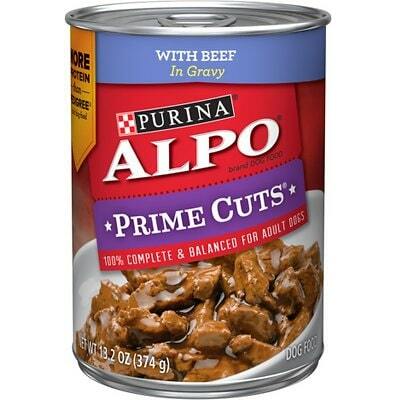 ALPO Prime Cuts Savory Beef is made in the United States. That’s a good thing, because the dog food laws and regulations in the USA are higher than many other countries. The meat quality in this food is relatively low. That’s because it includes unnamed animal ingredients like Meat and Bone Meal and Animal Digest. Both of these don’t make it clear which animal they are sourced from, not good. Beef Tallow is also included as a fat source, which shows it comes from beef - much better. 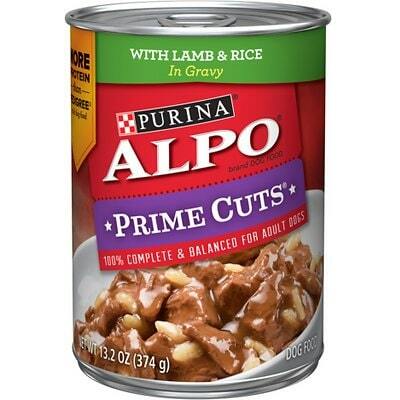 ALPO Prime Cuts uses three artificial colors. All of them are unnecessary in dog food and a potential health concern. 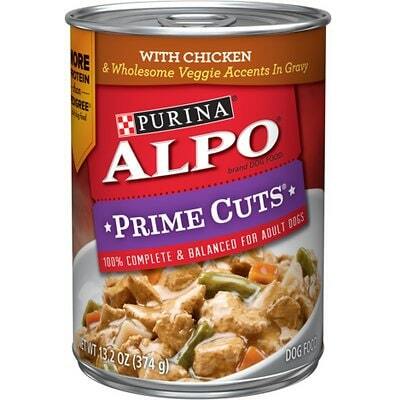 Besides colors, ALPO Prime Cuts also uses an artificial flavor, called “Egg and Chicken Flavor.” The food would be much better without it. Purina, the company that owns ALPO, has an above-average number of recalls. Take a look right below to see details on recent recalls.